Welcome to the Greyfriars Index (not forgetting Rookwood, St. Frank's and St. Jim's). Greyfriars school is the creation of one of the greatest - and certainly the most prolific - children's authors of the last century, Charles Hamilton writing as Frank Richards (and also known as Martin Clifford, Owen Conquest, and many many more). This site includes detailed information on his most important work, with complete listings of all of his stories about the famous schools: Greyfriars, St. Jim's and Rookwood in the boys' weekly papers, annuals and post 1940 novels. It also includes a wealth of illustrations from original publications, as well as complete listings for the St. Frank's stories (mainly published in the Nelson Lee Library and written by Edwy Searles Brookes). However, I've called it the Greyfriars Index because my favourite stories are those of Greyfriars in the Magnet. I've also tried to give a flavour of the fiction itself, and some indication of why I've gained so much pleasure from reading and re-reading the stories over the last 30 years or more (from when my father bought me the Greyfriars Press Holiday Annual for 1973 for Christmas 1972, I suspect more as a nostalgia trip for him, as he just remembered the original Magnet and Gem before they folded prior to the Second World War). Simply use the links at the top of the page to explore the site in detail. The Publications page will give a list of all the publications covered on the site, with links to the relevant pages. I've taken a bit of a break from the site to concentrate on other projects, but am now back on track to start adding to the listings and the Nelson Lee Library scans. Listings in Acrobat format for the famous girls' story papers "The School Friend", "The School Girl", "Schoolgirl's Own" and the "Schoolgirls' Own Library" are now available on the Publications page. 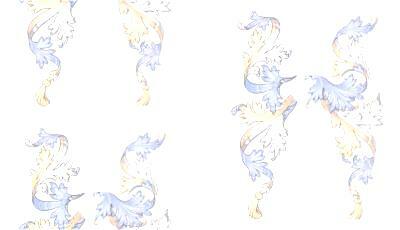 They will be followed over the next few weeks by the html version, including a variety of illustrations. This is something of a curiosity, in that I stumbled across the Frank Richard's story in here by chance (thanks to an email from Stella & Rose's books). 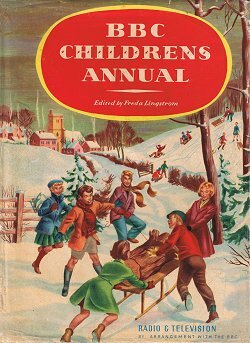 The BBC Children's Annual ran from at least 1953 - 1959; but I don't know whether any other volumnes also contained a story by Frank Richards. The story, "Just Like Bunter!" plays with a familiar theme - inking a form master - but I don't remember reading this version of it anywhere else. It looks like it might be an original story rather than one of the many reprints from Billy Bunter's Owns and Tom Merry's Annuals that other 50's and 60's publications used. The story is accompanied by some photos of the 1955 cast of the Billy Bunter TV series (which ran from 1952 - 1961, so there may be original stories in other BBC annuals of the period). This annual also contains what may be an original Biggles story, "The Flying Crusuaders". Previous "publications of the month" are on the main publications page. I've had a few requests to publish more of the St. Frank's stories in the Nelson Lee Library, following the appearance of the first St. Frank's story in publications of the month. I'm going to try and publish the complete 4th (and final series) first, and then follow it with selected stories from the earlier series. The first few issues from the final series of 1933 are now up, and now I'm adding some early Nelson Lees from 1916-1918. Thanks to Keith, there are now also some issues from 1921 and 1925. If you can help by providing scanned images (or clean photocopies for scanning), please contact me with details of what you have. Please let me know if you spot any errors, think something is missing or simply want to comment on the site. I should stress that this is still a site in development (and the design elements are currently in a state of transition). Also, that this site looks best in Internet Explorer 7, and I'm still working on making it look as good in Firefox, Safari and Chrome (the joys of different browsers rendering differently!). I am in the process of moving management of the site across from FrontPage to Expression Web. It's much stricter on html and css compliance; but once I've finished moving and auditing the files, pages should render the same regardless of which browser you use. Note: Publications of the month and the main indexes on this site are also available for download in Adobe Acrobat format. Right click the link on the relevant page (i.e. the publications page or the introductory page for a given comic) and choose "save target as" to download the acrobat file. Click the logo below to get the latest version of Adobe Reader if you don't already have it.